Continuity mistake: When Kong is lying in the hold of the Tanker, Jessica Lange's character is leaning over looking at him when her scarf falls off. When it lands on Kongs chest, it appears to be the size of a (very) large dinner table cloth. Revealing mistake: When Kong first shows up to take Dwan away, he roars and pounds his chest. As he does so, the breastplate in Rick Baker's costume vibrates visibly in a way that a flesh-and-blood chest wouldn't. Factual error: When the Petrox engineers dump Kong into the pit filled with chloroform they haven't knocked him out - they've killed him. Chloroform vapour is heavier than air so Kong is breathing it in a pretty pure form - and it is lethal in concentrations as low as 40,000 parts per million. In the time it would take to render a gorilla unconscious by this method, it would die. This ignores the fact that liquid chloroform is a severe irritant and a contact poison, and its breakdown products include phosgene and hydrogen chloride, both deadly poisons. They might as well save themselves some time and use that dinky little bulldozer to fill in the pit. Factual error: When Kong falls in the pit containing the chloroform and passes out, you can see some of the boat crew members walk into the chloroform cloud to look in the pit. Wouldn't they pass out also? 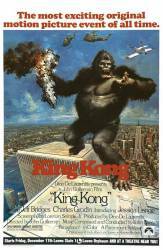 Revealing mistake: Near the end Kong rolls off the top of the World Trade tower. It cuts to a shot from the ground looking straight up toward the top with Kong falling downward. For a fraction of a second there is no image of Kong composited into the shot: first there's just buildings, then suddenly Kong appears from nowhere in midair. Continuity mistake: When the group of natives has discovered the Petrox crew and begins approaching them, a closeup shows Dwan moving from a crouching to a standing position and nervously taking a few steps back to stand behind Jack. The camera then switches to a long shot and she again stands up and moves behind Jack. Factual error: How does Kong return a radar signal? If organic material is suddenly detectable by ship borne radar, why isn't it picking up the trees and other animals? Did someone invent gorilla-detecting radar? Factual error: The fact that the respiration of a single animal - however large - could lead to an increase in the level of carbon dioxide in the local area is so absurd it is laughable. Carbon dioxide exhalation is part of a closed loop cycle and the CO2 exhaled by Kong would be matched by the CO2 taken in by the plants growing on the island. It cannot be otherwise. Elevated levels of carbon dioxide are incredibly dangerous and any animal living on the island - including Kong - would suffer if things got out of kilter. Continuity mistake: At the top of the twin towers, Kong hits the same chopper twice. Continuity mistake: When Jeff Bridges and the girl escape while Kong is fighting the snake, they jump into the water and get soaked but a few moments later their clothes and hair are completely dry. Dwan: You know I had my horoscope done before I flew out to Hong Kong. And it said that I was going to cross over water and meet the biggest person in my life.